Orange County - T.Webber Plumbing, Heating, Air & Electric. Are you an Orange County, NY homeowner looking for an electrical, HVAC or plumbing company nearby? Look no further! 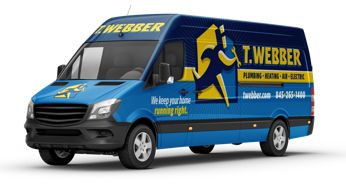 T.Webber has been delivering expert plumbing, heating, air conditioning and electrical services to Orange County homeowners since 1989. A+ Rated by the BBB, we pride ourselves on our attention to detail, expert craftsmanship and speedy response time. From New Windsor to Monroe, Middletown to Montgomery and everywhere in between our staff is standing by to ensure you have the quality service you need, when you need it most. Emergencies don’t always happen in a 9-5 world. At T.Webber – we understand that. When something goes wrong in your home – you need a company you can rely on to deliver prompt, professional emergency service. Whether your well pump was struck by lightning and you have no water, your heat goes out in the middle of the night, or your basement is flooded – call T.Webber. Our Experts are standing by 24 hours a day, 7 days a week to ensure your problems are resolved with speed, efficiency and care.